Welcome to the Systems Engineering, Architecture and Knowledge (SEAK) Lab’s website! We are part of the Department of Aerospace Engineering at Texas A&M University. Here in the SEAK Lab, we are passionate about space, artificial intelligence, and design. Our research focuses on the development of advanced tools to support the systems engineering process, with emphasis on early system design and system architecture. Every system has an architecture: its essence, a high-level abstraction of its design. System architecture decisions are of critical importance: most of the performance and lifecycle cost of a system are fixed or committed by architectural decisions. And yet, most organizations still select system architectures based on unstructured, completely human-driven processes. This results in potentially sub-optimal architectures chosen from a very reduced set of candidate architectures, due to limitations of human cognition: biases, inconsistency, short-term memory limits, and low “computational speed”. On the other hand, much more structured, computer-aided processes are used in later phases of system design. These tools bring rigor, consistency, and exhaustiveness into the design process. Why can’t we use similar processes for system architecture? The answer is that system architecture is a much more open-ended, ill-posed problem that goes well beyond configuration design. This is the kind of task at which humans excel, and computers cannot accomplish. 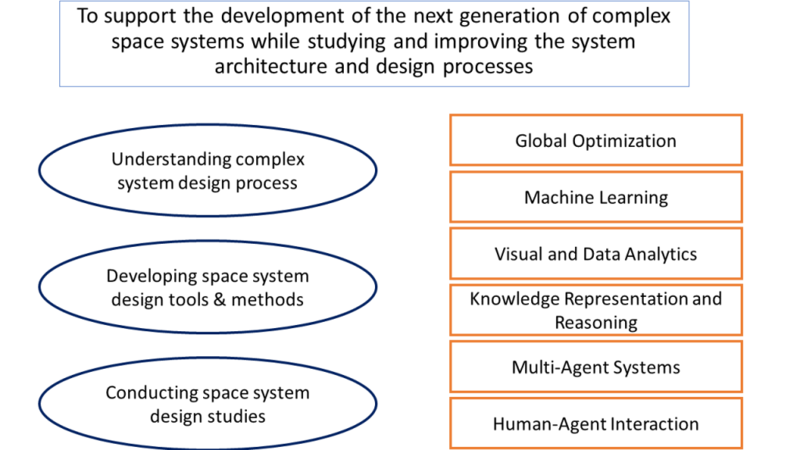 What is needed is a set of intelligent and interactive tools that make the most of the strengths of humans and computers to find good designs and facilitate knowledge discovery, and a theory of how humans and intelligent agents interact to collaboratively explore the design space. Our group strives to address these problems by using a mix of computational and human experiments to assess the performance of the tools we develop, which combine logical and probabilistic reasoning systems, global optimization, machine learning, and visual and data analytics, among others. We apply these tools to a variety of complex systems, mostly focusing on space systems such as Earth observation and communications satellites. Our tools are being used to design NASA missions, such as the TROPICS mission. Check out our past and current research projects here.